There’s something about a Texas harvest festival that makes us feel right at home. Whether you’re a life-long Texan or visiting, celebrating the season like a Texan means you’re part of the family. Enjoy Lone Star hospitality and the cooling weather by losing yourself among the corn fields at the following 10 best corn mazes in Texas. At’l Do Farms is more than just a funny name. Since 1987, this family-owned farm has been providing fantastic crops to the Lubbock area, as well as fall celebrations. This fall, come in to experience either their regular corn maze of the “Fairy Tale Trail,” an easier maze for those more interested in a nice stroll than navigating through winding paths. Barton Hill Farms in Bastrop, Texas opens their doors for fall celebrations from late September until early November. Their fall harvest festival activities include “taking fall photos and picking out your pumpkin in the pumpkin patch…getting lost in the corn maze, jumping on the jumpkin pillow, playing human fooseball,” and much more. Check out their website for a full list of activities. Dewberry Farm has a cornucopia of fall activities. Opening in late September, they invite you to come enjoy their slide mountain, barnyard, pumpkin patch, and massive corn maze. That isn’t even half of the activities on the agenda, so check out their website for more. Home of the South Texas Maize, Graff 7A Ranch offers a seven-acre maze, hayride, twin cow train, hay bale jump, pig races, and more included in the price of a ticket. Their online calendar provides more information about upcoming live music events, too. Hall’s Pumpkin Farm and Corn Maze in Grapevine, Texas is known for their hay rides, pumpkin patch, and corn maze. 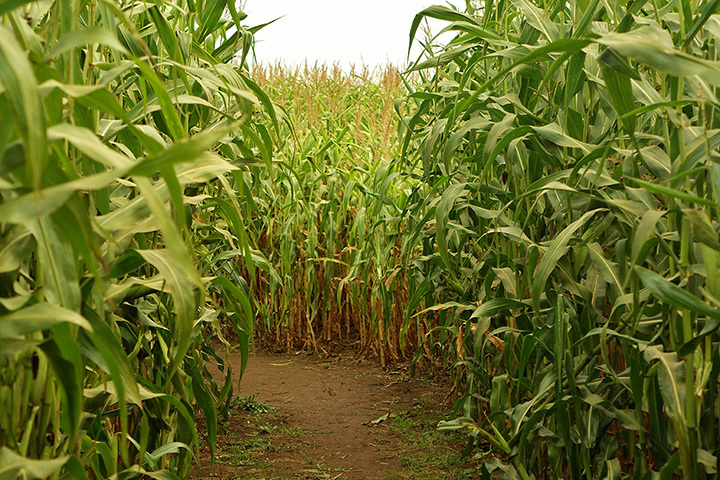 With over two acres of nine-foot-tall corn, maze lovers will love the twist and turns and dead ends. Think you’re up for a challenge? Come after dark and try it with a flashlight. According to their website, Donna’s Corn Maze is a “family owned and operated, outdoor entertainment facility.” Their mission? “To provide the best family entertainment experience.” Enjoy their hay bale mountain, super slide, corn box, adventure barn, hay rides, pedal karts, and, of course, corn maze. P-6 Farms in Montgomery, Texas opens in late September and runs into mid-November. Fall and Halloween lovers will enjoy their fall festival, corn maze, field of screams, and more. The field of screams begins in October and claims to be “the scariest corn maze in Texas.” Make sure to bring an extra pair of pants—just in case. Rocky Creek Maze in Moulton, Texas has a great corn maze, it’s true, but the main attraction for us is their haunted trail. Starting in mid-October and running on Friday and Saturday nights, the haunted trail transforms the corn field behind the regular corn maze into a terrifying horrorscape. If you’ve ever felt that regular corn mazes were too easy for you, this should be the challenge you’ve been seeking. Circle S Acres is a wonderful, family friendly spot to enjoy the season with the entire family. Activities include a pumpkin patch, barrel train, games, and corn maze. The maze boasts four acres and more twists than a mystery novel. Conveniently located near the Dallas/Fort Worth Metroplex, Preston Trail Farms in Gunter, Texas offers a pumpkin farm, hardware and feed store, petting farm, café, and hay maze. Make a day of it with the family to ring in the fall. View more Texas Corn Mazes.